I just spent the morning helping out at my local comic book shop, Legends of Superheros, for Free Comic Book Day (FCBD). The wonderful folks at Legends had tons of comics, FCBD wrist bands, T-shirts, and more. Legends had something extra special this year too. 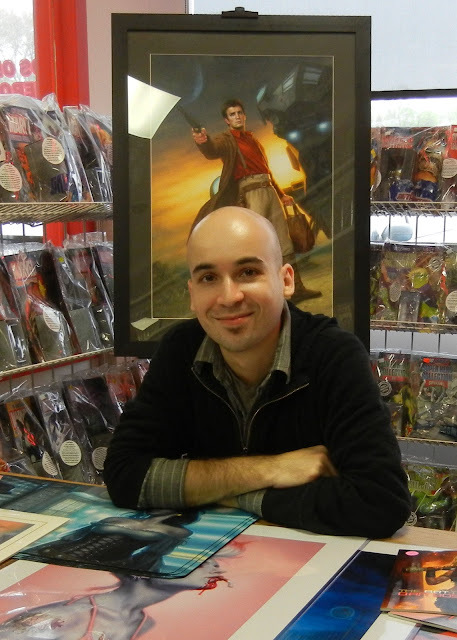 Cover artist Dan Dos Santos was on hand to sign the gorgeous cover he created for Dark Horse's Serenity comic for FCBD (the flip side of the comic is Star Wars). The cover features Mal Reynolds (Nathan Fillion). You can read about how Dan created the cover over at io9. You can see the original cover painting behind Dan. I want to share a bit of FCBD with you. I'm giving away a copy of the Serenity/Star Wars comic with the Serenity cover signed by Dan! 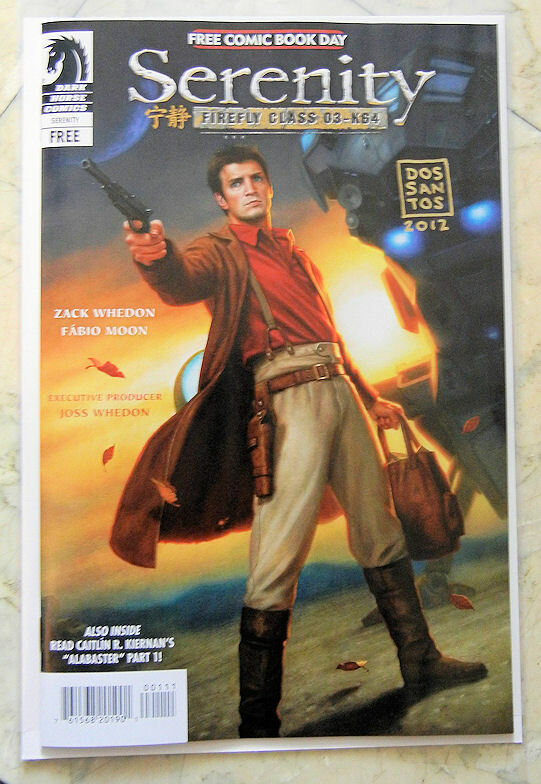 What: One commenter will win a copy of the Serenity/Star Wars FCBD comic signed by Dan Dos Santos. Favorite Science Fiction TV show or movie or novel? Please leave links for Facebook, Twitter, or blog/website mentions. In addition YOU MUST LEAVE A WAY TO CONTACT YOU. Who and When: The contest is open to all humans on the planet earth with a mailing address. Contest ends at 11:59pm US Eastern Time on Saturday, May 19, 2012. Void where prohibited by law. No purchase necessary. You must be 18 years old or older to enter. Now I gotta go retweet this post so I can get all 3 of my points: commenter, follower, retweeter! Don't be jealous.... okay, be jealous. Dan is one of the nicest people ever. The only comic I have a vivid memory of reading was Doomsday, when Superman died and all the versions of Superman showed up. When I was a kid I read the Archie and Katy Keene comics. I started reading comics again when Joss Whedon released Buffy Season 8 in comic form. He released Angel Season 6 soon after. I love Firefly/Serenity so this is an awesome prize. Thanks for the giveaway! Neil Gaiman's Sandman!.absolute favorite comic series ever! I am soooooo jealous that you got to meet Dan Dos Santos! I love his Mercy Thompson and White Trash Zombie covers. They're too cool! As for Sci-Fi stuff, I'm a long time closet trekkie. I love Sci-Fi romances - Zoe Archer has a great series that just came out recently. I also like Gini Koch's Kitty Kat series. For scifi book: Dune. I seem to recall that the trilogy kept me awake for a number of days, reading all-night. Those were the days when I could go without sleep and still function during the following day! Ah, school days... Trilogy was completed in less than a fortnight. My favorite Sci-fi TV shows are Star Trek: The Next Generation and Firefly. My favorite comic books are Teenage Mutant Ninja Turtles, Usagi Yojimbo and Watchmen. That cover is awesome. I want that painting!!!! But the comic will be very cool also. LOVE Firefly. Never that into comics but I did read some of the Buffy comics when they first came out. Dr. Who is my primary Sci-Fi addiction. They've just re-released some classic episode books with the original covers. The Doctor rocks. Firefly is my favorite show!! So glad that they made a movie to wrap it up when it was canceled. I haven't read a comic book since I was a kid (I used to devour the Classic comic books - we got so mad at my Mom when she gave them away!). But when I saw that wonderful cover of Firefly I had to enter for this contest. I loved that movie/series. I wish it had run longer! I've always been a fan of BATMAN comics. All that angst. You know, I've never read comics. I've read a lot of manga though, and my favorite has to be Berserk by Miura Kentaro.